The Social Security Administration (SSA) calculates your primary insurance amount (PIA), upon which your retirement benefit will be based, using a formula that takes into account your 35 highest earnings years. At your full retirement age, you'll be entitled to receive that amount. This is known as your full retirement benefit. Because your retirement benefit is based on your average earnings over your working career, if you have some years of no earnings or low earnings, your benefit amount may be lower than if you had worked steadily. Retiring at full retirement age Your full retirement age depends on the year in which you were born. If you retire at full retirement age, you'll receive an unreduced retirement benefit. Your age at the time you start receiving benefits also affects your benefit amount. Although you can retire early at age 62, the longer you wait to begin receiving your benefit (up to age 70), the more you'll receive each month. You can estimate your retirement benefit under current law by using the benefit calculators available on the SSA's website, ssa.gov. You can also sign up for a my Social Security account so that you can view your online Social Security Statement. Your statement contains a detailed record of your earnings, as well as estimates of retirement, survivor, and disability benefits. If you're not registered for an online account and are not yet receiving benefits, you'll receive a statement in the mail every year, starting at age 60. Note: If you were born on Jan. 1 of any year, refer to the previous year to determine your full retirement age. You can begin receiving Social Security benefits before your full retirement age, as early as age 62. However, if you begin receiving benefits early, your Social Security benefit will be less than if you wait until your full retirement age to begin receiving benefits. Your retirement benefit will be reduced by 5/9ths of 1 percent for every month between your retirement date and your full retirement age, up to 36 months, then by 5/12ths of 1% thereafter. For example, if your full retirement age is 66, you'll receive about 25% less if you start benefits at age 62 than if you wait until your full retirement age (30% less if your full retirement age is 67). This reduction is permanent — you won't be eligible for a benefit increase once you reach full retirement age. However, even though your monthly benefit will be less, you might receive the same or more total lifetime benefits as you would have had you waited until full retirement age to start collecting benefits. That's because even though you'll receive less per month, you might receive benefits over a longer period of time. 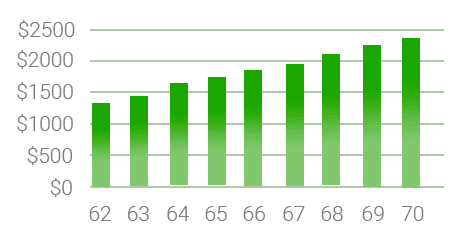 The following chart illustrates how much a monthly benefit of $1,800 taken at a full retirement age of 66 would be worth if taken earlier or later than full retirement age. For example, as this chart shows, this $1,800 benefit would be worth $1,350 if taken at age 62, and $2,376 if taken at age 70. You can work and still receive Social Security retirement benefits, but the income that you earn before you reach full retirement age may temporarily affect your benefit. Your eligible family members will receive a monthly benefit that is as much as 50% of your benefit. However, the amount that can be paid each month to a family is limited. To find out more about Social Security Retirement Benefit Basics, contact us for a free consultation.